ENSLAVED are also pleased to announce a collaboration with BMG Publishing for their upcoming release. 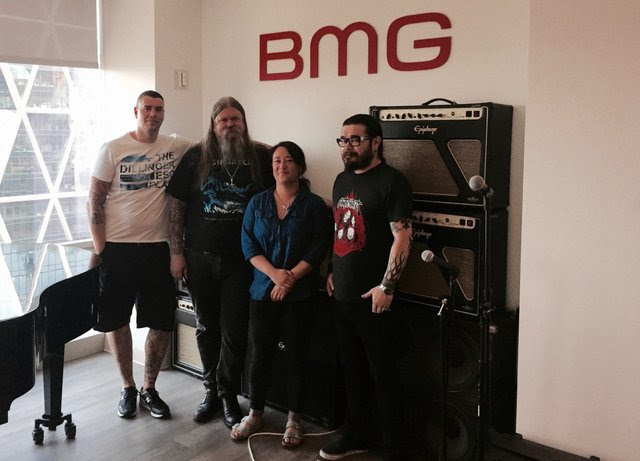 "We are very happy to be joining BMG Publishing! ", states the band. "To be part of such an eclectic roster including GHOST, KILLSWITCH ENGAGE and many others will help us spread our wings further on many levels. We are very much looking forward to this corporation." In case you missed the stunning music video of the 10 minute epic single"Storm Son" animated by Josh Graham [SOUNDGARDEN, NEUROSIS] you can watch on the Nuclear Blast YouTube Channel! You can now pre-order the physical editions of the album here: HERE! Or get the digital version and stream new track "Storm Son" via this link: HERE! Between September 25 and 28, 2017 Enslaved will be recording a series of career-spanning songs at the state-of-the-art Laboratoire audionumérique de recherche et de creation (LARC) at Université Laval in Ste Foy, Québec. These recordings will be an integral part of the ENSLAVED 25 biopic – a Norwegian-Canadian documentary film co-produced by ENSLAVED founders Ivar Bjørnson and Kjetil Grutle, alongside Canadian film-making duo Vivek Venkatesh and David Hall. Sign up to the band's newsletter on HERE to get first-hand information on limited fan items and exclusives!